I have been making this dish for YEARS and I’d like to think it is semi-famous at this point. Everyone who has ever tried it always asks me for the recipe right away or weeks later or months later…I even had someone ask me for the recipe years after I had made it for them. Needless to say, it is a meal people remember!!! I usually make mine with veggies – green beans and/or zucchini are my fav but you could put ANY vegetables in that you like!! Bell peppers, bamboo shoots, mushrooms, onions, etc, etc!! Or…you could keep it a plain and simple chicken dish. Any way you make it, it is going to be AMAZING. Place ghee or oil in a large saute pan over med-high heat and and add chicken, curry powder, and garlic powder once oil is hot. Stir to make sure spices coat all the chicken and then cook until chicken begins to brown. Add broth & coconut milk and bring to a boil. Reduce heat to medium and add peanut butter and let melt into sauce then add sriracha sauce to taste (I like mine spicy, but use as much or as little as you like!). **This would be the point you could add more PB if you want. Toss in veggies of your choosing and let it all cook for about 5-10 minutes. Make sure you keep stirring as it will thicken up and you don’t want the delicious sauce to burn! 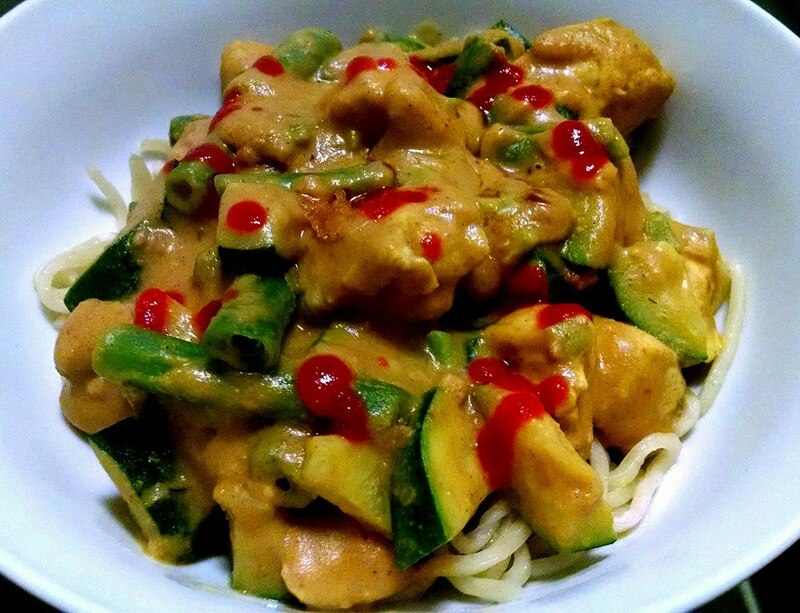 Serve by itself, over rice, over shirataki noodles, over rice noodles, over zucchini noodles, over regular noodles, over couscous, over ANYTHING you want!!! Heck, it would probably even make a good sandwich!!! It is also great as leftovers 🙂 And if you like spicy, don’t be afraid to add more sriracha!!! This looks really delicious! I can’t wait to try this out. Make sure you let me know how you like it!!! I have a facebook page that I update with all my new blog posts, also! !